The Nissan Pathfinder is closely related to the Infiniti JX35, a model that starts at about the same price (about $42k) as the top 2013 Nissan Pathfinder Platinum. The 2013 Nissan Pathfinder is in a new place that's just right for families who want a big, comfortable, sensible wagon, but it's given up some of its path-finding heritage to get there. The Nissan Pathfinder is a mighty familiar SUV nameplate in the U.S. market. It's been around more than a quarter century; yet this year it warrants a complete reintroduction. Current or former Pathfinder owners looking to rekindle their relationship with the new version are likely to be sorely disappointed, as the 2013 Pathfinder doesn't exactly follow in the previous model's footsteps. This is no longer a musclebound truck; and Nissan wasn't shooting for rock-crawling ability, or powerboat-towing prowess. Those who clear their preconceptions will find who Nissan was opening the doors to: families, and especially families who need a little extra space. For that, you'll likely find the Pathfinder to be an attractive, well-thought-out vehicle that performs better (and more efficiently) than a number of other family crossovers on the road—where it matters. The 2013 Nissan Pathfinder has made that transition to a passenger-oriented uni-body design—now with just a dash of ruggedness—and its styling, with a soft, rakish tall-wagon look, communicates exactly that. 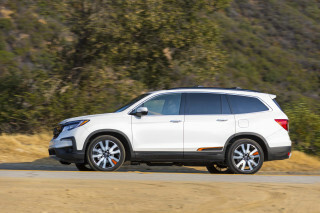 It's a little more swept-back, rakish, and curvaceous compared to other large crossovers, with a much more swept-back stance compared to most rival models; altogether it's more wagon-like to our eyes than any of its rivals, like the Highlander, Pilot, or Explorer—not a bad thing, really. The Pathfinder's heavily sculpted front fenders and rear fender accents give the design the right degree of 'pop,' and they fit right in with the design aesthetic of Nissan's latest passenger-car models like the Altima and Sentra. Inside, there's some trickle-down design and appointments from Infiniti for sure, but unremarkable materials and a limited set of just two rather drab interior colors makes the cabin feel unexpectedly conservative. Provided you keep to the streets and highways—as Nissan is anticipating that the vast majority of Pathfinder owners will do—this is a vehicle that responds far better than last year's model of the same name. All Pathfinders are now powered by the familiar 3.5-liter 'VQ' V-6, which has been used in everything from the 370Z to the Maxima and Murano, all in somewhat different tunes. 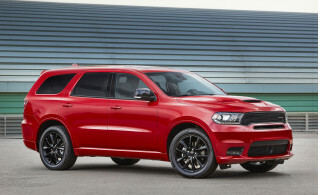 Here it makes 260 horsepower and 240 pound-feet of torque, is good to go on regular-grade gasoline, and provides strong, smooth acceleration with the continuously variable automatic transmission (CVT). With a wider span than the previous unit—and a sturdy chain instead of a belt—this CVT allows quicker acceleration and lower revs when cruising, although we note that there's quite a delay for quick bursts of power for passing. Otherwise when you're behind the wheel of the Pathfinder, it's quite easy to forget that you're driving any kind of utility vehicle. The Pathfinder responds in corners much more like a softly spring sedan than an SUV, and it drives without the nagging sense of heft that heavier models like GM's full-size crossovers (which weigh several hundred pounds more) have. The hydraulic-electric steering in particular is excellent. Models with four-wheel drive come with an Auto mode, as well as a 4WD Lock mode that sends an equal 50/50 to the front and rear axles, with traction-control electronics managing distribution side to side. 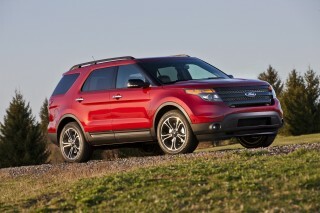 There’s also a 2WD mode that can boost your gas mileage slightly when roads are completely dry and clear. There's still some trail ability here, but don't expect much more than you'd get in, say, a Subaru Outback (there's actually less ground clearance). When equipped with the tow package, the Pathfinder can pull up to 5,000 pounds, and the chain-driven CVT will settle to a different cruising RPM depending on loads. The new Pathfinder feels like it was designed for passenger comfort, interior space, and interior flexibility above nearly all else. 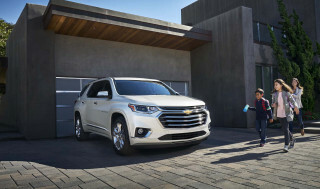 It fits in for height and width within a few inches of the Honda Pilot, Ford Explorer, and Toyota Highlander, yet it's quite a bit longer than any of those models—a few inches shorter than the super-roomy GM full-size crossovers (Traverse, Acadia, Enclave) and around the same length as the Mazda CX-9. Most of that length goes to the cabin, and it follows that the Pathfinder actually fits three usable rows of seating. Second-row bench accommodations can be slid back up to 5.5 inches when there's nobody back in the third row, though adults may find it hard to get comfortable as they're quite short, flat, and van-like, as well as surprisingly low—inviting a sort of legs-splayed position. The third row is low and hard, with barely enough headroom for an average adult—in other words, it's roomier than the typical third row. And the second row has a trick ‘Latch and Glide’ function that lets you leave child seats in place while tilting the second row forward. 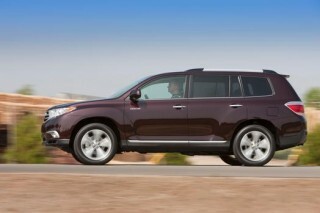 Ride quality is another strength for the Pathfinder. It's smooth and refined—Nissan has paid extra attention to secondary vibrations—and you don't hear or feel minor road coarseness. Wind noise is also kept under wraps even at Interstate cruising speeds, and the V-6 here is one of the few engines mated to a CVT that doesn't drone insufferably when accelerating rapidly. Nissan boasts that the Pathfinder provides “premium features for all passengers,” and especially if you spring for one of the higher trim levels, and some key options, that's true. Opt for the top-of-the-line Pathfinder Platinum and for a bottom-line price of about $42k (4WD) you get the tow package, cooled front seats, the Bose audio system, navigation, and an Around View Monitor, all with a higher-resolution eight-inch WVGA display. With the available Nissan Navigation System, you also get traffic information, Bluetooth streaming audio, and voice recognition. Also on offer is a tri-zone entertainment system that lets you play separate programming for each of the two seven-inch rear screens (DVD, gaming input, or photos), all while front-seat occupants can listen to their own programming. All that's missing on the Pathfinder is the taste of high-tech convenience features—like adaptive cruise control, or a blind-spot system—that are starting to jump from luxury brands down to the mainstream. 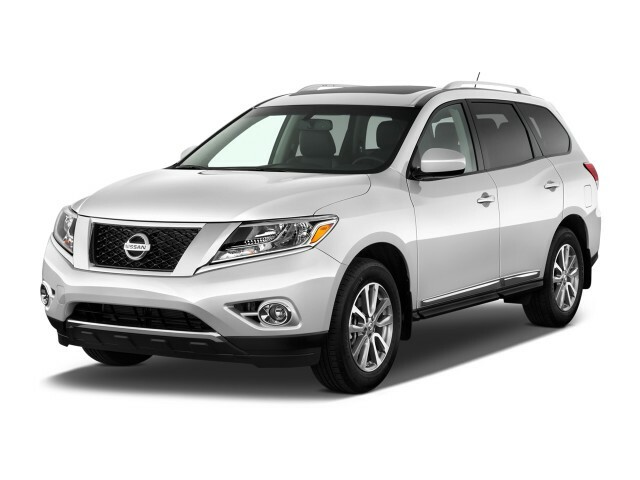 The 2013 Nissan Pathfinder is flamboyant for a family vehicle on the outside, as it's a little more swept-back, rakish, and curvaceous compared to other large crossovers; but inside the style is uninspiring, even a bit drab. The 2013 Nissan Pathfinder is no longer an upright, body-on-frame SUV; rather, it's a passenger-oriented uni-body design—now with just a dash of ruggedness—and its styling, with a soft, rakish tall-wagon look, communicates exactly that. The Pathfinder looks more like a larger model up from the Rogue compact crossover than it does a pure SUV—and just like the Rogue, it fully moves on from the boxy, upright SUV look, favoring a much more swept-back stance compared to most rival models. 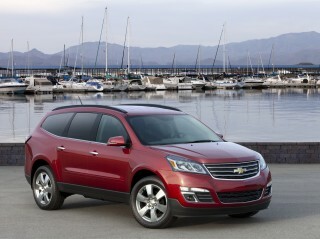 It's now more wagon-like to our eyes than any of its rivals, like the Highlander, Pilot, or Explorer. The new Pathfinder was officially designed at Nissan Design America, in San Diego, but the design concept was from Europe, and although the previous generation was more focused on the U.S. market the new version will go on sale in more than 70 different countries. But Nissan has been doing an excellent job as of late in making sure all of its products fit right in with the same design aesthetic, and you can see some of the same styling cues on the Pathfinder—especially along its sides—that you see in some of Nissan's latest passenger-car models like the Altima and Sentra. For instance, contour lines ‘flow’ up around the front fenders, then just below the beltline, with a flare above and around the rear wheelwells. And especially of note in the Pathfinder is the thicker diagonal chrome bars at the grille—maintaining a bolder look than in Nissan's cars—and how they continue as aggressive creases that carve out curvaceous sheetmetal just behind the headlamps and over the front wheel wells. That's our favorite feature of the Pathfinder's design, and it gives this vehicle a flamboyant styling 'pop' from the front. Although we do remain puzzled why Nissan opted not to offer either HID headlamps or LED running lamps. Inside the Pathfinder isn't particularly groundbreaking. And in truth, there’s much borrowed from Infiniti models of recent years. There's a lot of smooth, hard, textured plastic throughout the interior that looks like it would wipe easily, while the hard, more glossy material of the dash top meets the more soft-touch, semi-matte, and almost-coordinated material of the door panels somewhat inharmoniously, in constant sight of the driver. It doesn't help either that while the exterior is offered in a number of cheery colors, the interior is limited to just two rather drab colors--Almond and Charcoal. Rock-crawling ruggedness is no longer part of the Pathfinder’s repertoire—and instead its on-the-road performance has far more aplomb. The 2013 Nissan Pathfinder isn't built with the same kind of off-road hardiness and true-truck ability as before; this time the priority is the street, the highway, and to some degree, the curvy back road. All Pathfinders are now powered by a very familiar engine and powertrain. Nissan’s 3.5-liter 'VQ' V-6, which has been used in everything from the 370Z to the Maxima and Murano, all in somewhat different tunes, is what’s under the hood here, and it makes 260 horsepower and 240 pound-feet of torque, with the latest version here getting some new friction-reduction measures. Otherwise, it’s good to go on regular-grade gasoline and provides strong, smooth acceleration with the continuously variable automatic transmission (CVT). The CVT is the latest high-torque unit, with a chain instead of a belt, and it has a wider ratio span than the previous unit used with V-6 engines. While that helps provide faster acceleration times as well as lower-rpm high-speed cruising, what suffers somewhat (as we've noted in Nissan's other newer wider-ratio units) is responsiveness. When you need a quick rush of power for squirting past traffic at, say, 30 mph, and the CVT is already lugging at low revs, there can be quite a delay from the time you kick the accelerator to the floor until revs ramp back up. When you're behind the wheel of the Pathfinder, it's quite easy to forget that you're driving any kind of utility vehicle. The Pathfinder responds in corners much more like a softly spring sedan than an SUV, and it drives without the nagging sense of heft that heavier models like GM's full-size crossovers (which weigh several hundred pounds more) have. The hydraulic-electric power steering feels responsive enough for its intent, with excellent weighting and decent on-center feel, plus good body control, for the most part. Quick maneuvers in one direction then the other, on small choppy back roads, revealed a little bit of bias transfer to the back that made it feel less dynamically inept than, say, the Toyota Highlander. There's one letdown here. Apparently in order to meet mileage targets, the Pathfinder wears some relatively low-traction low-rolling-resistance tires (Continental Cross Contact LX 18-inchers for most of the models) that, we feel, detracts from the driving experience, giving us far less grip than it feels the suspension and reasonably well-controlled body could handle. Larger 20-inch wheels and tires are offered in top-of-the-line Platinum models, and while we didn't get quite the chance to give one of these a workout, we noted the same issue here. On front-wheel-drive models you do get noticeable torque steer (a pulling to one side and/or the other on hard acceleration, even if you have enough traction. Models with the so-called All-Mode 4x4-i system come with an Auto mode that sends most power to the front wheels except when it’s needed in back for more traction or stability; a 4WD Lock mode engages the equivalent of a center diff lock, sending an equal 50/50 to the front and rear axles, with the electronic system still managing distribution side to side. There’s also a 2WD mode that Nissan officials say can be engaged to boost your gas mileage slightly when roads are completely dry and clear. In an early drive opportunity, we had a chance to take the Pathfinder on a steep, dry, and slightly rocky two-track, and found the Pathfinder's all-wheel drive capability to be beyond what most family shoppers will expect. There's less ground clearance than you'll find in a Subaru Outback, but the suspension feels up to the task on rutted surfaces. When equipped with the tow package, the Pathfinder can pull up to 5,000 pounds, and the chain-driven CVT will settle to a different cruising RPM depending on loads. The Pathfinder's passenger-friendly design and versatile layout affords seating for up to seven—plus a smooth, quiet ride—but second-row seats could be more comfortable. While the previous Pathfinder's cabin took second stage to tow ratings and all-'round ruggedness, the 2013 Nissan Pathfinder feels like it was designed for passenger comfort, interior space, and interior flexibility above nearly all else. The Pathfinder fits in for height and width within a few inches of the Honda Pilot, Ford Explorer, and Toyota Highlander, yet it's quite a bit longer than any of those models—fitting in a few inches shorter than the super-roomy GM full-size crossovers (Traverse, Acadia, Enclave) and around the same length as the Mazda CX-9. Most of that length goes to the cabin, and it follows that the Pathfinder actually fits three usable rows of seating. In front, the Pathfinder has reasonably comfortable front seats, with good back support and, for the driver, a wide range of adjustability. They don't have any real side support, but they seem built well enough for a long day on the highway—and anyway, this isn't the kind of vehicle to take out testing lateral g-forces on canyon roads. In the second row, the seats are a bit disappointing—and it's not for lack of space. Even though the bench accommodations can be slid back up to 5.5 inches when there's nobody back in the third row, adults may find it hard to get comfortable as they're quite short, flat, and van-like, as well as surprisingly low—inviting a sort of legs-splayed position. It must be a concession necessary for the seat-folding arrangement to work out well, because there's plenty of headroom above. Those second-row seats in the Pathfinder, while not all that comfy, have several useful features. Lift a lever alongside the upper portion of the seat, and there's an access mode that lets you tilt the seat surprisingly far forward for stepping back there. Using that same lever, if you have a child seat mounted, with a so-called ‘Latch and Glide’ function you can simply leave the seat there (but not the child, of course) when you're tilting the whole arrangement forward for access to the back. The third row is way low; and even then we saw some average-height adults have issues with headroom. It's perfectly sized for bringing an extra couple of kids to practice, though—and the third row seatback is adjustable for rake. You get plenty of bins in the Pathfinder, nice map pockets at the back of the front seats, and two large trays in the center console. Nissan offers a seemingly ridiculous three bottle holders per rear door in back, plus cupholders alongside the third row and in front, two solid cupholders plus one bottle in each door. Seatbacks for both the second and third rows, if you so choose, can be flipped forward to a flat—well, almost—cargo floor and space, with a total of 79.8 cubic feet. Keep all three rows up and there's not all that much space—just 16 cubic feet, and enough for a modest family grocery run. Ride quality is another strength for the Pathfinder. It's smooth and refined—Nissan has paid extra attention to secondary vibrations—and you don't hear or feel minor road coarseness. Wind noise is also kept under wraps even at Interstate cruising speeds, and the V-6 here is one of the few engines mated to a CVT that doesn't drone insufferably when accelerating rapidly. We dare say it sounds okay. We don’t yet know how the 2013 Nissan Pathfinder will fare in crash tests, but its feature set is missing some helpful tech features that are fast becoming expected, at least as options. The Pathfinder comes with all the typical passenger-car safety technology, in features that include stability control, a traction control system, four-wheel disc anti-lock brakes, Brake Assist, and six standard airbags, with the side-curtain airbags offering a rollover sensor and covering outboard positions in all three rows. A standard Easy Fill Tire Alert is also potentially helpful in sounding the horn when you've inflated the tires to the recommended pressure. Most versions of the Pathfinder have a rearview camera system as well as rear sonar parking assistance, but only Platinum versions wrap in a multi-view camera system that can make a huge difference in outward visibility, whether on a tight trail or backing out of the driveway. If you thoroughly peruse the list of what’s included here versus in rival family-crossover and rugged-crossover models, there are two pretty significant groups of safety-tech items that are missing from the Pathfinder. One is active-safety features such as lane-departure warning or blind-spot warning systems; the other is off-road aids such as hill descent control. The National Highway Traffic Safety Administration (NHTSA) gives the Pathfinder four out five stars in frontal and rollover crash tests, and the crossovers a five-star rating for side impacts. The 2013 Pathfinder is one of the better-equipped family crossovers for the money, but its tech features and interface aren't quite at the leading edge. 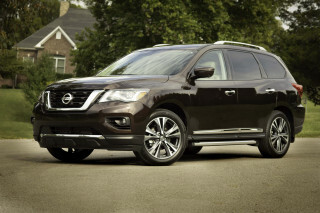 Nissan boasts that the Pathfinder provides “premium features for all passengers,” and especially if you spring for one of the higher trim levels, and some key options, that's true. Features offered at the top of the 2013 Pathfinder lineup include a dual panorama moonroof, tri-zone automatic climate control, a heated steering wheel, heated-and-cooled front seats, heated second-row seats, and two memory settings for the driver’s seat, the steering wheel, and audio/navigation settings. Nissan is offering the Pathfinder in four different trims--S, SV, SL, and Platinum--each with a choice between front-wheel drive and four-wheel drive. Nissan points out that the Pathfinder costs less than the base Honda Pilot, Toyota Highlander, Ford Explorer, and Chevrolet Traverse and costs less than all but the Highlander and Pilot at the top end of the lineup. At the base S level, the 2013 Pathfinder includes the tri-zone climate control system, an Advanced Drive Assist trip-computer display, 18-inch alloy wheels, and a six-speaker sound system with six-disc changer, although Bluetooth hands-free connectivity isn't included. Step up to the SV and you get Intelligent Key entry and start, roof rails, Bluetooth, and a seven-inch color monitor with RearView monitor and Rear Sonar. The mid-range SL provides a hint of luxury, with leather upholstery, heated front and rear seats, remote engine start, and a power liftgate; and for $2,650 extra you can opt for a Premium Package with Bose 13-speaker premium audio, a dual panorama moonroof, and trailer-tow prep (offered separately for $400 on the other models). Opt for the top-of-the-line Pathfinder Platinum and for a bottom-line price of about $42k (4WD) you get the tow package, cooled front seats, the Bose audio system, navigation, and an Around View Monitor, all with a higher-resolution eight-inch WVGA display. With the available Nissan Navigation System, you also get XM NavTraffic and NavWeather functions, a Zagat Restaurant Guide, Bluetooth streaming audio, and voice recognition. Also on offer is a tri-zone entertainment system that lets you play separate programming for each of the two seven-inch rear screens (DVD, gaming input, or photos), all while front-seat occupants can listen to their own programming. The dual DVD entertainment system is offered as a standalone port-installed option, as is a cargo package, illuminated kick plates, and a few other minor items. What's missing on the Pathfinder is the taste of high-tech convenience features that are starting to jump from luxury brands down to the mainstream. 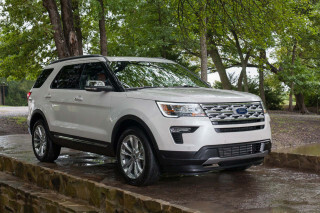 The Ford Explorer, for instance, offers MyFord Touch, a more sophisticated, albeit sometimes frustrating, interface, as well as things like adaptive cruise control or a blind-spot system. The Pathfinder's dash also feels a little cluttered functionally. Both the screen system that comes with most versions and the higher-resolution navigation screen look like they're going to be touch screens but instead rely somewhat (or entirely, for the smaller one) on a rotary controller and series of buttons below. If you're limiting your budget but want a V-6, the 2013 Nissan Pathfinder is the most fuel-efficient three-row crossover you can get. The Pathfinder earns impressive EPA ratings for its class--20 mpg city, 26 highway with front-wheel drive, or 19/25 with four-wheel drive. Nissan calls these figures best in class, although of models with a third-row seat, only the base Ford Explorer, with front-wheel drive and the 2.0T (EcoBoost) four-cylinder engine, does better; it gets 20/28 mpg. The base four-cylinder Toyota Highlander also comes close, at 20/25 mpg, and the Highlander Hybrid has it solidly beat at 28/28 mpg. 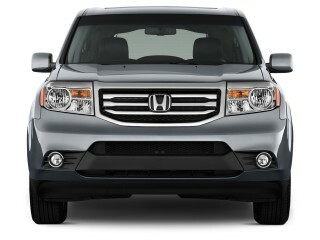 However the Highlander Hybrid starts at around $40k, just short of where a fully loaded Pathfinder tops out. And if you wanted to extend your shopping up into the luxury brands, the Lexus RX 450h also does significantly better than the Pathfinder, while the Mercedes-Benz GL 350 Bluetec beats the Nissan by 1 mpg on the highway. 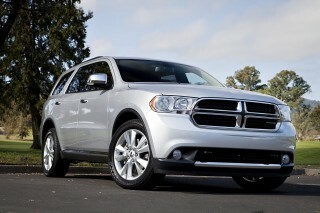 Big, comfortable vehicle with a lot of standard features in the Platinum model. Looking for a different year of the Nissan Pathfinder?